In 2018 Rail Baltica Global Project reached several key milestones at strategic, technical and financial level remaining on track to launch operations by 2026. 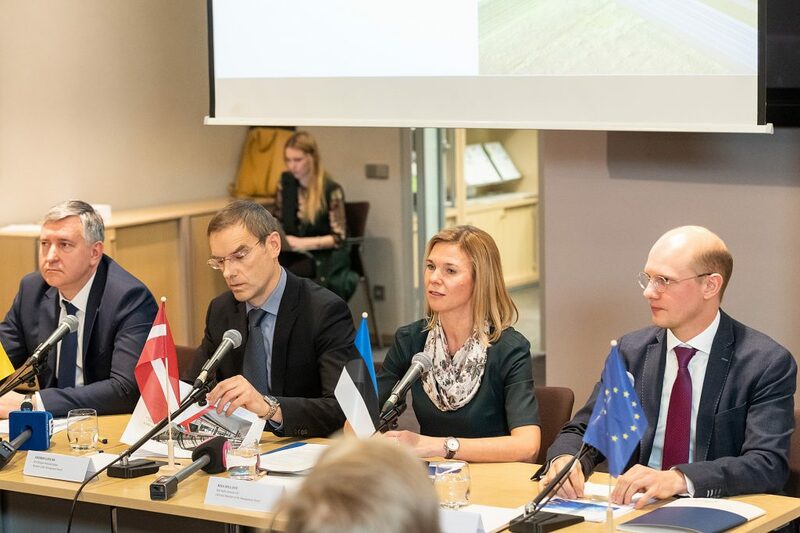 The European Commission adopted the Implementing Decision of the cross-border Rail Baltica project for the North-Sea Baltic TEN-T Corridor in October 2018, reinforcing the commitment of the European Commission and all EU Member States to implement the project on time. Furthermore, deeper cooperation with Finland and Poland was achieved. Namely, transport ministries of the Baltic states invited Finland to join the Rail Baltica joint venture RB Rail AS as a shareholder, while Poland announced the analysis and plans to potentially increase the speed on the railway infrastructure from Lithuanian-Polish border to town of Elk to match the Rail Baltica Global Project technical parameters. Finally, Rail Baltica Global Project was included in the EU Military mobility policy. Several important studies relating to the future operations were developed during 2018 such as the Rail Baltica Operational Plan, Rail Baltica Infrastructure Management Model Study and Rail Baltica Business Plan. The Operational Plan provides optimal infrastructure planning and realisation for Rail Baltica international passenger and cargo services as seen from the sustainable long-term perspective and covering the period by 2056. In addition, it outlines initial passenger demand assessment in each country for regional traffic providing the Baltic governments with a comprehensive regional development tool. Furthermore, the Infrastructure Management Study, carried out by a leading international consultancy Atkins, provides an independent and fact-based assessment of the most cost-effective model of Rail Baltica infrastructure management. In 2018 the Common Design Guidelines of Rail Baltica Global Project were approved, setting the standard of technical parameters for the railway line to ensure technical interoperability in all three countries and with European railway network. In addition, procurements of the detailed technical designs for the main line were launched for 7 out of 11 sections covering 57% of the entire railway line in the Baltic states. For Estonia, the detailed technical design procurements are underway for the entire line from Latvia/Estonia state border to Tallinn. In Latvia, 2 out of 4 designs have been launched for approximately 120 km section around Riga. In Lithuania 2 sections out of 4 are being procured for the length of 120 km section, spanning from Kaunas to Lithuanian/Latvian state border. We are happy to see a strong interest of experienced European and Baltic companies participating in the procurement of the detailed technical designs – 53 bids were received all together. Throughout 2018 6 Rail Baltica reference groups were created covering topics of technical, operational, business, financial and communication matters. This process allows ensuring exchange of knowledge and closer alignment between involved parties within the project. The Rail Baltica Global Project secured the third Connecting Europe Facility (CEF) grant. As a result, Global Project available funding until 2023 reached 824 million EUR, out of which up to 85% come from the European Union and 15% are co-funded by the national governments. RB Rail AS announced 31 procurements in 2018 with the total indicative value of over 43 million EUR. In 2018, 26 contracts were signed with the total value of 1.83 million EUR. From these 53% of the contracts’ value were awarded to the Baltic companies. RB Rail AS procurement process was executed effectively – out of 31 procurements launched in 2018, only one procurement was appealed (estimated value 285 800 EUR), one cancelled (estimated value 42 000 EUR) and one – retendered (estimated value 150 000 EUR). Efforts to improve the Global Project procurement policies to ensure transparency and best practice application throughout the project is continuously on the agenda of the Joint Venture. This year, the key focus of RB Rail AS together with the implementing bodies will be on starting timely delivery of the detailed technical designs, which is a precondition for strengthening the project maturity as well as to apply for next phase funding to start construction works on the main line by 2021. Several significant studies will be carried out in 2019 to help with decisions regarding energy supply; railway maintenance facilities; control, command and signalling; and safety. In addition, we will explore how to ensure synergy between 1435mm and 1520mm railway networks to unlock full commercial potential of the Rail Baltica line in the future. In 2019 decisions regarding construction supply materials procurement system and construction logistics will also be taken aimed at accelerating a resource-efficient project implementation. Indicative list of procurements for the Global Project in 2019 is available at www.railbaltica.org. In 2019 RB Rail AS will focus on deepening cooperation with Finland and Poland, aim to secure Global Project sustainable financing beyond 2023 and enable development of local infrastructure facilities. The development of Rail Baltica in Estonia moved steadily along in 2018 with spatial planning finalized and route set. Preliminary design phase which was also completed last year has given a more detailed view on the preliminary technical solutions and the indicative costs envisaged before entering the detailed technical design phase. 2019 will see the first construction beginning on the main route of Rail Baltica in Estonia with building a road bypass in Tallinn. Other important objects like passenger terminals in Ülemiste and Pärnu but also Muuga freight terminal will be advancing to the design phase. In 2018, the national implementing body SIA “Eiropas Dzelzceļa līnijas” signed the first Rail Baltica railway design contract, related to the Rail Baltica station in the Riga International Airport (RIX) and approximately 4 km of the main line section. The Rail Baltica RIX Station design sketches are already approved, and construction permits were issued on 18 January 2019, allowing to proceed with finalisation of the design stage in 2019 followed by announcement of construction procurement. To incorporate the Rail Baltica railway line in the Riga centre, it is planned to begin design works in the section from Lāčplēša iela to Jelgavas iela, including the placement of Rail Baltica track, interlinked 1520mm infrastructure reconstruction, estacade development, stripping of embankments and construction of a new bridge over river Daugava. The procurement for Riga Central Station has reached the tender evaluation phase. The main task of the designer will be not only to ensure the most effective and sustainable technical solution, but also -in close cooperation with the Riga City Municipality, experts and other infrastructure owners, to provide continuous mobility for transport and residents, ensuring safety during the construction process. In 2018, extensive cultural and historical heritage research took place for the whole 265 km Rail Baltica line in Latvia. It confirmed that the positioning of the track does not endanger any cultural or historical heritage. Teams of archaeologists, geodesists, and historians worked to identify the 126 potentially culturally or historically important locations and objects. Probing was done in more than 5500 places and underwater exploration was executed in 5 rivers, together with 3D scanning and measuring of historical objects. During 2018 a consensus to build double track in phases was found between the partners and the EU institutions regarding Kaunas Node, one of key nodes of the Rail Baltica line according to the Operational Plan ensuring interconnection between railway networks of both 1435 mm gauge and on 1520 mm gauge. The Poland/Lithuania border – Kaunas node line upgrade feasibility study has been completed in 2018, concluding that part of the line shall be improved in its technical parameters in to reach Rail Baltica Global Project Design guidelines. For this the Government of Lithuania has commenced territorial planning procedures for the line. In addition, an ambitious plan for 2019 has been prepared – construction of Kaunas Node 1st phase, design of Kaunas-Latvia border section, territorial plans for Poland border-Kaunas-Vilnius. Currently there are several key ongoing activities (territorial planning, land acquisition, technical design, construction works) on the whole Rail Baltica line on the territory of Lithuania.